So, we’ve just covered the Young Guns movies. Let’s take a look at the movie theater landscape the years that these movies came out. Here’s a newspaper ad for the original Young Guns. It was cut out of my hometown paper, The Birmingham News, back in 1988, right after I saw it. I used to collect movie newspaper ads like this for every movie I saw. By 1988, I had mostly stopped, but I wound up loving this movie so much that after I saw it I went back home, dug the paper out of the trash and cut out the ad. That was how the Young Guns ad looked. What other ads could have I have seen in the paper that day? 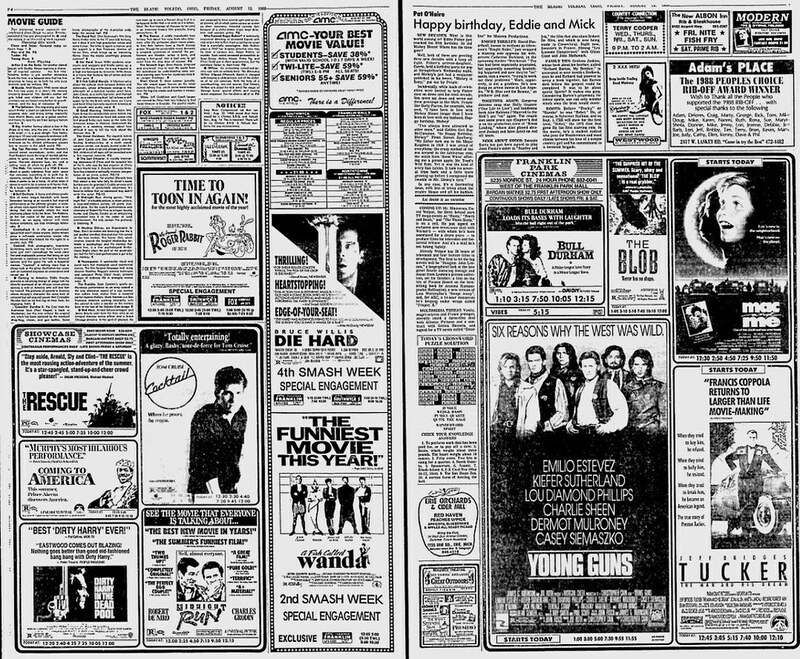 Above is a sample movie section from August 12, 1988, the Friday that Young Guns was released. You can see Die Hard and Bull Durham, Cocktail, Who Framed Roger Rabbit?, Tucker as well as Mac and Me. Also check out ads for Midnight Run, The Dead Pool (fifth and final Dirty Harry movie), the remake of The Blob and A Fish Called Wanda. Kind of a lot to see there. 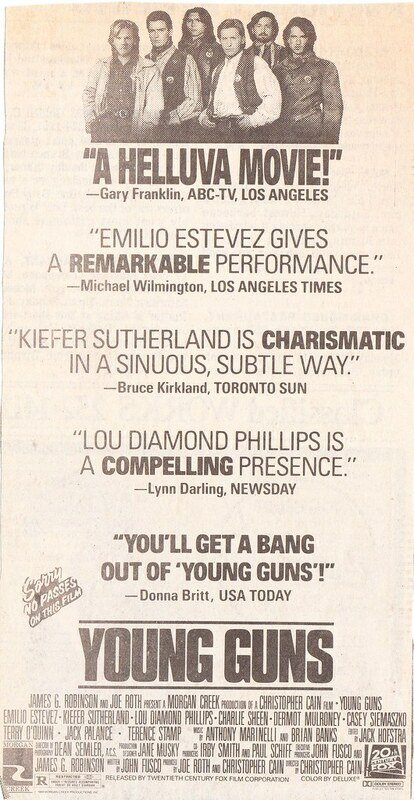 Then, in 1990, when Young Guns II was finally released, I was ready and cut out the ad the day the movie was released. 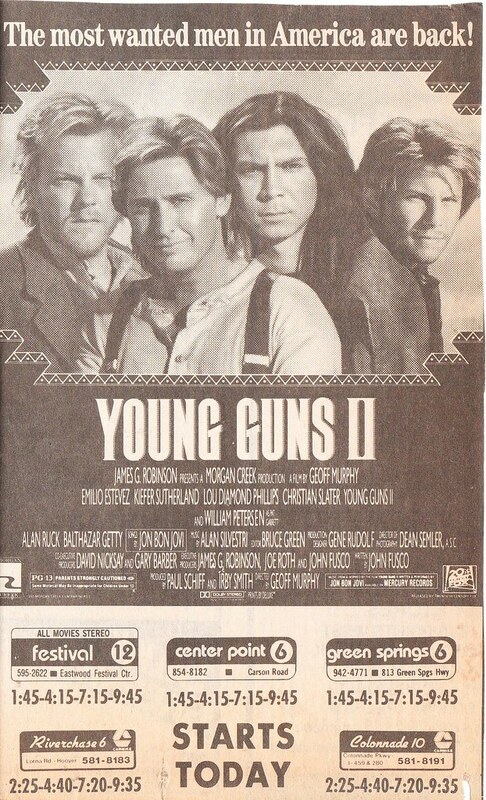 What sort of ads would I have seen the day Young Guns II was released? Well, Young Guns II was actually released on a Wednesday (Aug 01, 1990), which typically doesn’t have a very big movie section. 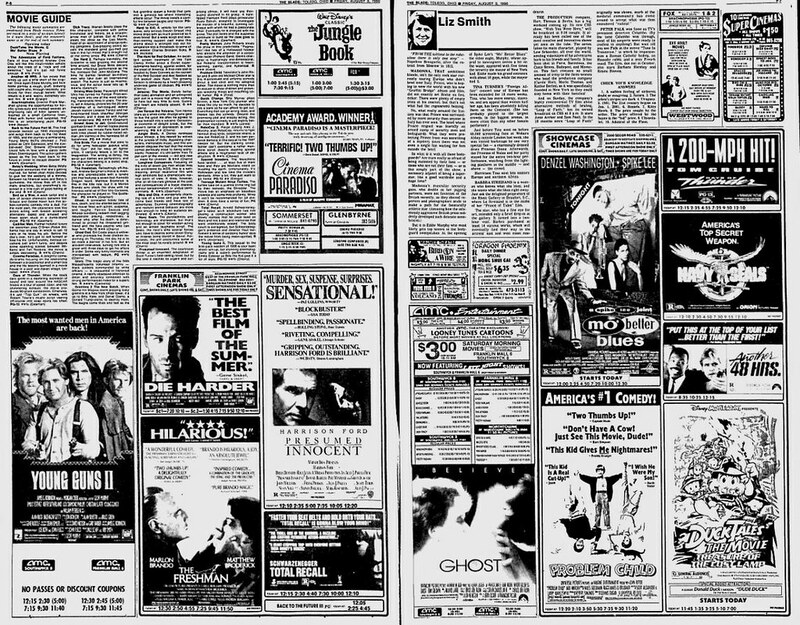 So let’s take a look at that Friday’s movie section, Aug 03, 1990. Lots of stuff to see. The Die Hard sequel is out at the same time, which means the first two Die Hard movies coincided with the first two Young Guns movies. Also out was Ghost, Total Recall, Navy Seals, the Duck Tales movie and Problem Child. Oh, and I see Another 48 Hours is tucked away there as well as Days of Thunder. What movies did you watch that weekend? PreviousCult Film Club Episode 22b: Young Guns II! Man I miss these ads….